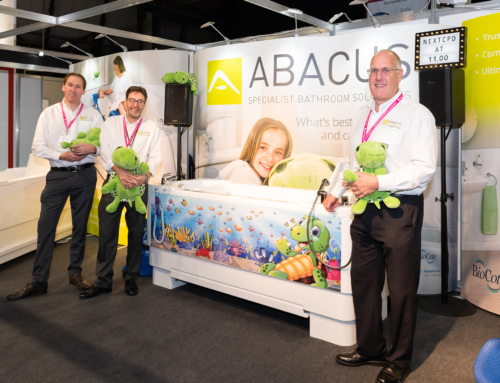 Leading assisted bath specialist Abacus Healthcare will be offering educational seminars, free advice guides and a ‘Tiny the Turtle’ free prize draw at DNEX 2017. 27-28th Sept: DNEX (Disability North), stand 49, Newcastle Racecourse, High Gosforth Park, Newcastle upon Tyne NE3 5HP. Free admission. DON’T MISS THE ABACUS ASSISTED BATHING SEMINARS: 10:30-11AM BOTH DAYS. DNEX is an exhibition that provides information, advice and equipment for disabled people, older adults, carers and health and social care professionals. It offers the opportunity to experience products and services first-hand so greater independence can be achieved. Abacus Healthcare will be demonstrating its popular power-assisted Gemini and Scorpio baths on stand 49 and during a series of educational seminars based on its nationwide ‘Lunch and Learn’ roadshows and #BathingIsBetter campaign. The Gemini is unique in the marketplace as it is the only bath with an integrated platform and dual lift functionality. The changing, drying and bathing platform eliminates awkward transfers so safety and comfort is enhanced for carers and bathers. Once the bather is positioned on the platform the bath sides are raised to immerse the user in temperate controlled water. The second stage lift which involves raising the whole bath can then be activated so carers benefit from a safer working height. Without the need to bend over or manual lift when attending to disabled bathers carers are protected against possible back and musculoskeletal injury. Also on display, the popular Scorpio from Abacus includes a manual or powered transfer seat that lifts and lowers disabled bathers into the bath. It is compact, versatile and can either have a fixed height or include hi-lo functionality. From an educational point of view Abacus will be demonstrating why its bathing solutions are ideal for more effective moving and handling. In the Demonstration Zone at DNEX a senior Abacus Product Specialist will explain why the Gemini is a proven solution through evidence-based practice. Abacus will include content from its well-attended ‘Lunch and Learn’ training sessions which run across the UK and assist Occupational Therapists and Moving and Handling Specialists. The seminars will include brief bath demonstrations and Q&A sessions regarding safe assisted bathing. To complement these presentations free advice guides and case study literature will be available which are part of the ongoing Abacus #BathingIsBetter campaign. This social media initiative is empowering families and therapists to discover why bathing is more beneficial than adapted showering and how to achieve funding for a specialist bath. On a more light-hearted note, children visiting the show will be offered the chance to win a Tiny the Turtle soft toy – Trevor the Turtle’s recent off-spring! Winning the new baby turtle mascot from Abacus is also available to therapists who wish to nominate young clients.